Makes engine starting a Snap! …ever seen a pump explode? A ‘Must Have’ for every pressure washer! This valve functions is as a safety backup to the unloader valve. It is rare for an unloader valve to fail to allow the water to by-pass when the trigger gun is released, but it does happen. In the event of this occurring, the safety pressure relief valve will release at a preset pressure. Without a relief valve, equipment damage and injury is possible. This valve should be installed in one of the high-pressure outlet ports of the pump, or elsewhere downstream of the pump but upstream of the first shut off point on the equipment, be it a ball valve or trigger gun. Don’t install the relief valve where it will spray on someone should it open. 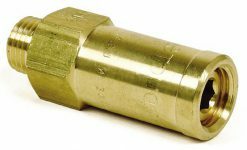 The relief valve is a very simple design with a seat, ball, and spring. It should be adjusted to open when the pressure in the system exceeds the normal high spike pressure that occurs when the trigger gun is released. 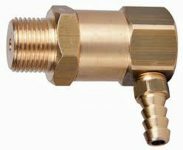 Pressure relief valves are adjustable within a preset range. They normally have an adjusting nut or set screw. To properly adjust the valve, begin with the adjustment bolt of screw set out as far as possible, while still in enough to be securely contacting the threads. Start the pressure washer. The valve may leak when the trigger gun is open and should leak when the trigger gun is released during the pressure spike. When the trigger gun is closed, turn the adjusting bolt or screw in one revolution. Open and release the trigger gun, if the relief valve still leaks, turn the adjustment bolt or screw in another full revolution. Continue this procedure until there is no leaking. When you reach this point, adjust in an additional ½ turn. Now the valve will open if there is an unusual spike in pressure, and it will protect your equipment from damage. Excessive Heat! The Pump Killer! Thermal Relief Valves are a ‘must have’ for pressure washers when the water is supplied by a garden type water hose. When the operator releases the trigger the pump’s unloader diverts the water back to the inlet side of the pump. This is referred to as a ‘closed-loop’ by-pass. When this happens and you do not have a thermal relief valve you have approximately 3 minutes before the pump head will heat up to approximately 165 degrees. By now it has already exceeded pump manufacturers warranty which is generally 150 degrees. In 4 minutes the head will have reached 190 degrees. Packings, seals, check-valves as well as other components of the pump start to deteriorate at 160 degrees. With a Thermal Relief Valve installed should the temperature of the pump head reach 145 degrees this valve will open and allow cool water to enter the pump head. If you don’t use this valve be sure and keep our phone number on hand. We love selling kits and pumps.